Roger adores antique instruments by the 'old masters' and never passes up an opportunity to make a close study of one. He also knows, from the experience of his clients and friends, that new 'copies' can be a sensible alternative when old ones may be damaged or tired. From an investment point of view, a faithful copy by a renowned maker can be an attractive idea. Described as a 'dangerous man', by a leading expert, Roger takes pride in the fidelity of his copies. 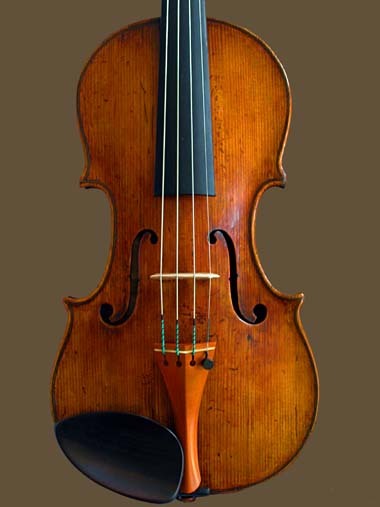 He sees himself as a small link in a chain of makers which includes John Lott and J.B.Vuillaume responsible for instruments which sound and look like mature examples but are unashamedly new, with all of the benefits this brings. Some of the tasks he has been set over the years have taxed him to the limit, but they are also his oxygen, and he likes nothing better than a cherished ‘old master’ brought to him for copying. This is not to say, of course, that he can only make instruments for those who have an original old instrument to hand. In practice, he works from originals, drawings, borrowed instruments, or a combination of these. Roger spends a lot of time with new clients, hearing them play, learning who they admire, what sound they like, or equally don’t like, in short, building as complete a picture as possible of exactly how the instrument is to perform at the end. 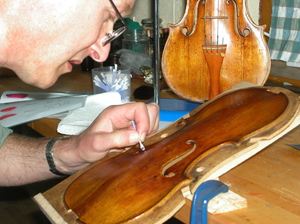 No two people have quite the same way of drawing sound from an instrument or want exactly the same end result; mirroring this, Roger has a range of techniques, the exact detail of which he keeps for his own use, for hardening and ageing wood and developing ground colours. This approach is relevant for facsimiles and regular instruments alike and will help him decide on wood selection and all the processes thereafter to completion. Roger listens to recordings on specialist electrostatic speakers, and often borrows recordings of performances which are especially dear to his client. By listening carefully ‘into’ the sound it is surprising how much detail he can pick up about an instrument, things like the volume of air inside the instrument and clues about the stiffness and hardness of the plates, an understanding which can be a huge help during the making. 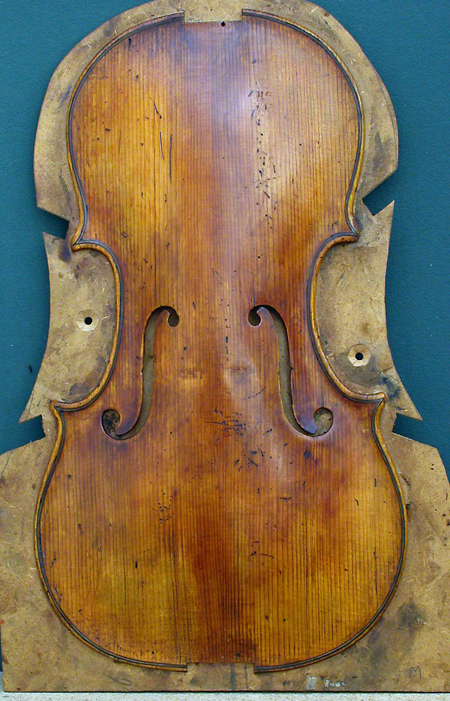 Work in progress on the violin shown at the end of this page. Roger encourages clients to play the instrument while it is still ‘in the white’ or unvarnished. This time can be extremely revealing and gives him another chance to address the detailed ‘feel‘ and sound. There will be talk about the varnish and he can begin to form in his mind the stages of varnishing and kinds of materials that will enhance the sound which is being pursued. Hearing an instrument ‘in the white’ also gives the opportunity to do minor alterations, perhaps fine tuning the feel of the neck or important changes to the bass bar, thereby inching closer and closer to the best possible result. Perhaps every maker has a favourite stage in the making process, and for Roger, aside from sound, and maybe because of his painting background he always looks forward to the varnishing stage with particular relish. He varnishes by instinct as opposed to a set of rigid rules, and each layer and its outcome determines the next layer and so on. This gives him total freedom and whilst things can go in an unexpected direction, he has the skill to seize the moment and turn it into a result of spectacular beauty. Creating the complex patinated surface of a copy is a painstaking process and he spends many, many hours on very small areas of varnish to achieve stunning results. Roger has a waiting list for commissions but it is often convenient and rewarding to test instruments which are available for immediate playing. There are usually one or two stock instruments at the workshop for those who wish to try his work or circumvent the waiting list. These instruments can be tried in the workshop or elsewhere by arrangement. Roger is known for making exact copies and these instruments will inevitably be the most expensive. It is only possible to give a definitive price once the client has discussed with him how they wish to proceed. Roger asks for a small deposit at the outset of any project and finds it then usually suits everyone to divide the remaining amount into several stage payments. These are invoiced at mutually agreed times. Please contact Roger at any time for an informal chat or to arrange an appointment with no obligations.